NOTE: The requirements noted here are specifically for the original Nightscout with an Android, a cable, and a Dexcom G4. If you are using a Dexcom Share receiver and the Dexcom Share app for iOS, see these directions. If you are using a Dexcom Share receiver and Android, you should review information about xDrip and then move on to the setup guide. Note: Any smartphone or device (iPhone, tablet, iPad, kindle, PC, iMac, etc) that can access the internet to see webpages can access and view the CGM data of the person you are following. The following items are the minimum requirements to install and run the system. These are the absolute minimum pieces needed; adding optional items (listed below) will customize your system to fit your lifestyle. Dexcom G4 receiver (also referred to as “Platinum” in the US). The receiver will stay within the same proximity to the sensor (near the T1 wearing it) as normal. Android smartphone supporting USB OTG. Follow this link for a list of phones that have been identified as compatible. The phone you choose is used only to transmit data from the receiver to the cloud. It has no other purpose. Note: USB OTG support is required on this phone AND Android v4.x or newer. The system will not work if the phone does not have full OTG capabilities or does not have the correct version of the Android operating system. Check here for lists of phones that are known to work and some that will not work with Nightscout. Special Cable(s) to connect the smartphone to the Dexcom receiver. USB OTG cable with adapter that connects the smartphone to the Dexcom receiver with the next cable. It allows the smartphone to read the data on the Dexcom. Micro-USB to USB Male cable to go from your Dexcom to the OTG cable. The Dex power cord that you already have is a Micro-USB to USB Male cable and can be used from the Dex- to -OTG part of the cabling. The Dexcom USB port is fragile and can break if you are not very very careful with this cable at all times. OR an all-in-one cable that combines the OTG cable with a micro-USB connection. Free software installed and databases created to store and read the data. These are free and are required as part of the installation process. Cloud-based database system through Mongolab.com. You do not need to know anything about database technology or even what a database is to handle this step. The setup instructions are easy to follow. Web hosting service through azurewebsites.net. Again, you do not need to know anything about this technology. The setup instructions will walk you through it all. A free app installed to your uploader device so that it can send the data to the database. Warning: the Dexcom port (the charging port that is covered by the slider) is extremely fragile. When you put the Nightscout cable into that port, you will need to secure it to keep it from jostling or being knocked out. The port can be dislodged easily. You can secure with tape or other substance. You can obtain a case made for the Nightscout rigs (search in the Facebook group for how to obtain one). Use extrreme caution whenever unplugging from this port as well. The following items are optional, but will extend and improve your experience with the Nightscout system. Cell data plan for the smartphone to stay connected to the cloud when you are out-of-range of Wifi. When you are out of range of wifi your system cannot upload the glucose data to the database. Cell service resellers such as FreedomPop (uses Sprint), Ting Wireless (uses Sprint), and Consumer Cellular (uses AT&T) offer low cost data plans, ranging from free to $15 per month. Major wireless carriers including Verizon, AT&T, Sprint, T-Mobile, and US Cellular offer data plans that work with your uploader phone, but prices vary. Check with your carrier for details. A second smartphone or other uploader device to hook up to the receiver while the first one is charging. Pebble, an internet-connected “watch” device. This is an unobtrusive way to have a quick and handy view of the T1’s glucose level along with other indicators about the system status. How Do I Know Exactly What to Buy? Note: If you are not based in the US click on your country name for location specific buying information. Australia, Canada, UK. Phone: Your uploader phone MUST be OTG capable and it MUST be an Android with OS v4.0 or newer. You must consider what your main goals are and select equipment and cell service to minimize hassle. If budget is of primary importance, consider the least expensive cell phone. Cable: You generally will need a USB On-the-Go cable that matches your phone, and a micro-USB to USB Male cable to go from your Dexcom to the OTG cable. Remember: the Dex power cord is a Micro-USB to USB Male cable and can be used from the Dex- to -OTG part of the cabling. Verify that the cable you choose will work with the phone/uploader that you are considering. Some phones/uploaders have two ports – one that the OTG cable fits into and another that you can charge the device at the same time. Making sure your OTG cable does not cover the charging port is something you may want to consider. Alternatively, there is an all-in-one cable that can connect directly from the uploader device (OTG end of the cable) into the Dexcom port. These are the cables used in the 3D printed cases. Not all sources of these cables provide the correct length or style to fit the cases. It is up to you as a consumer to find the right one. Search for micro OTG to micro USB. Both the 2-cable system and the all-in-one cable configurations are perfectly fine for use. The OTG cables can be found at specialty computer supply stores such as Fry’s and MicroCenter or through Amazon and other on-line sellers such as Hakshop.com, Todd the Vinyl Junkie, and other on-line outlets. Keep in mind that many sales people are not familiar with OTG and may not understand what you are looking for. You need to verify the cable is OTG by studying the packaging. 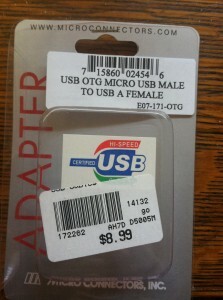 Look for packaging descriptions like the ones here. 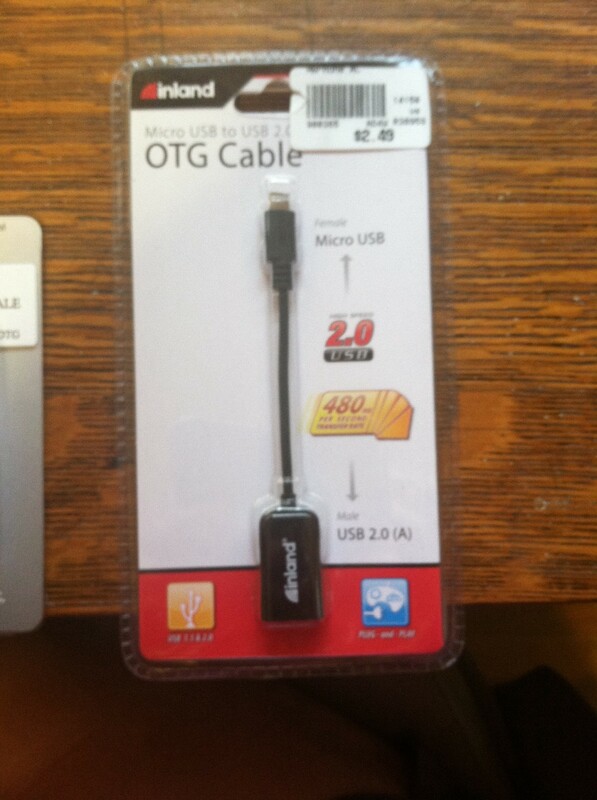 Some packaging will say HOSTING CABLE instead of OTG. Case: The case you choose is completely up to you. You want to make sure the rig will fit inside the case without putting pressure on the Dexcom port/cable connection. Some cases being used by others include Otterboxes, fly-fishing tackle boxes, Vera Wang bags, clear plastic zip-bags from the Container store and other cases from various sources. It all depends on the durability you require and the wishes of your T1D. 3D printed cases are available for various phone models. There is a file in the CGM in the Cloud group that you can use at a local 3D printer. Best advice: shop around and compare prices & features for your own needs. Cables to connect Dex to uploader: approximately $5 each/ $10 for two. Some are as expensive as $20 each. Azure website: $0-$1.00 per month. Minimum cost: $105 for set-up (first month), variable per month for following months. a tablet to act as an overnight uploader (it doesn’t have to be portable during night-time) for as little as $35 . 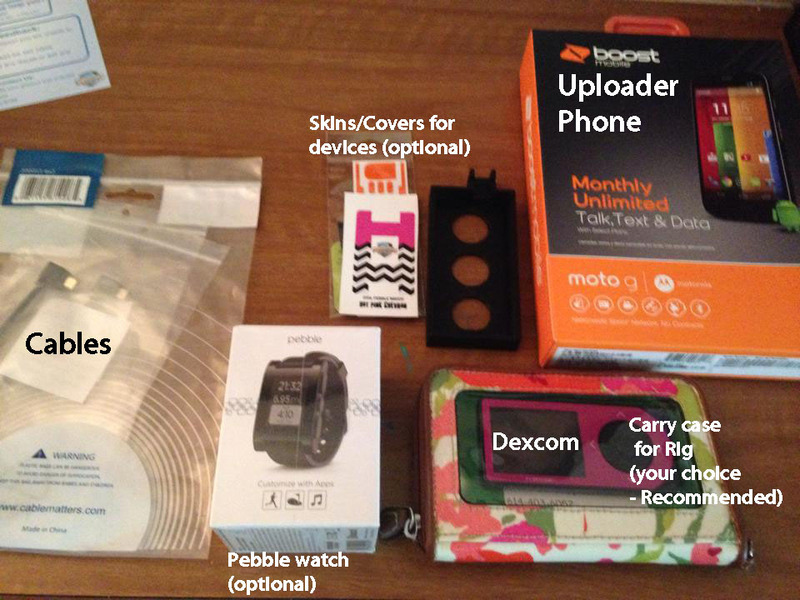 A Pebble device, adds $100 to the one-time costs. They can be purchased for less through various retail sales, E-bay, Amazon, etc. 2nd Dexcom receiver for back-up: $199-$600 depending on your insurance coverage, whether or not the prescription is current for the CGM and whether your current Dexcom receiver is still under warranty. Once you’ve gathered the necessary equipment for your setup, you are ready to start installation.